I found it was time to commence on some of my projects 2015. I did a full day of cleaning flash from a load of figures. Those priorised for this year concern SAGA and Longstreet. Here I only exibit those that I have also primed for painting. All together I found it quite easy to remove the flash from the GB figures. The Irish wolf hounds and handler were a treat to clean. No problems at all. 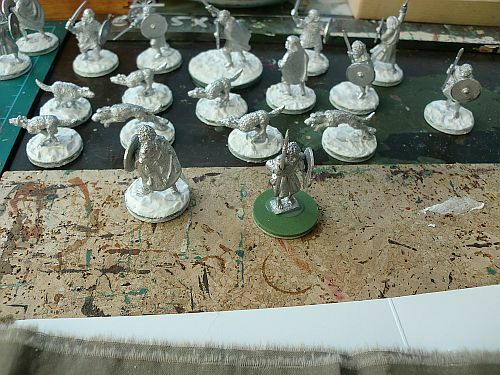 The other Irish models all have seperate shields that need to be soundly glued onto the left fist of the figures. 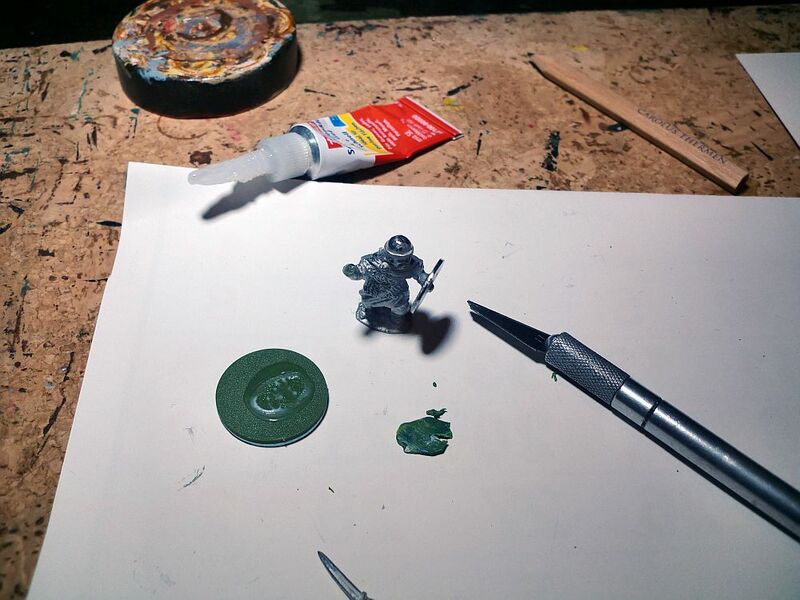 Some of the heathguard figures have quite fiddly parts that are somewhat difficult to attach firmly. I am unsure, if this is going to be a travelling army as I would be apprehensive of parts breaking off in transit. 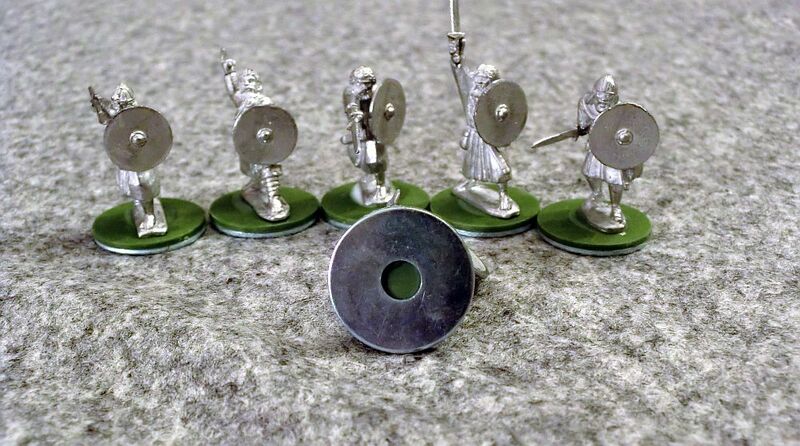 All the figures get their bases mounted on a 25mm washer. The warlord off course gets his 40mm washer. The washer lowers the barycenter of the figure and that will make it a firm stand on the tabletop. Also it allows storage and transportation on a magnetic mat. Next step is to model the bases for the warband. I have learned from documentaries on medieval Ireland that todays landscape of Ireland has only developed after the Norman occupation. Still, with the wet weather predominant on the island I will go for grassy bases. 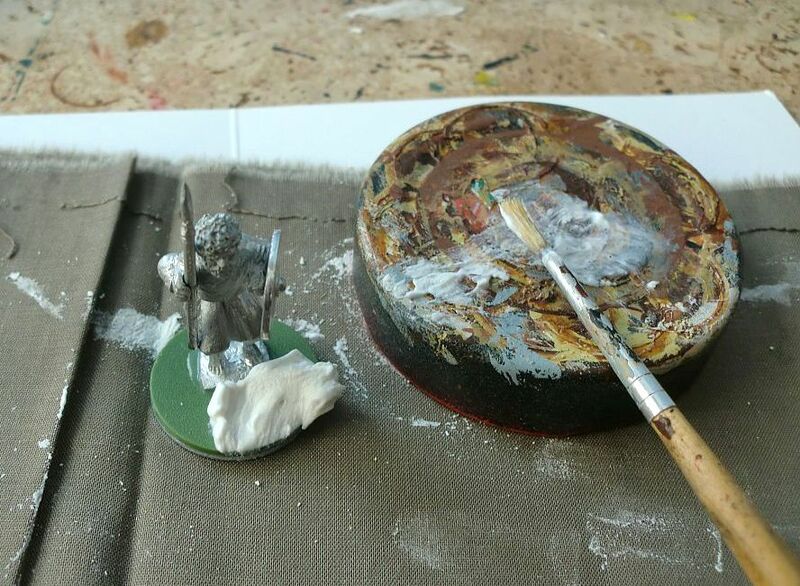 First I apply a layer of waterbases instant stopper onto the bases. I use a small brush for this work. 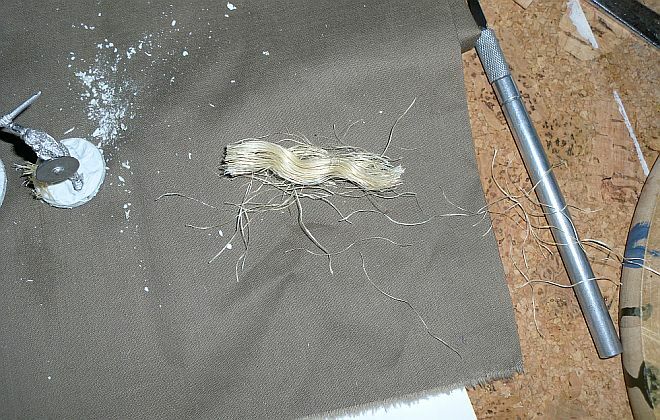 On the bases of the warlord and his champions I add a piece of hemp string cut to a 3mm strand. These will look like bushes when painted. Next step of course is priming. I use a light gray sythetic resin primer. It dries quickly and provides me with a good base coat for my painting. At this stage we can admire the 4 points warband fully cleaned, based, primed, and thus ready for painting. You can find the proud warlord in the midst of his men. They all are ready to take on any adversary that might come along and threaten their beautiful village. 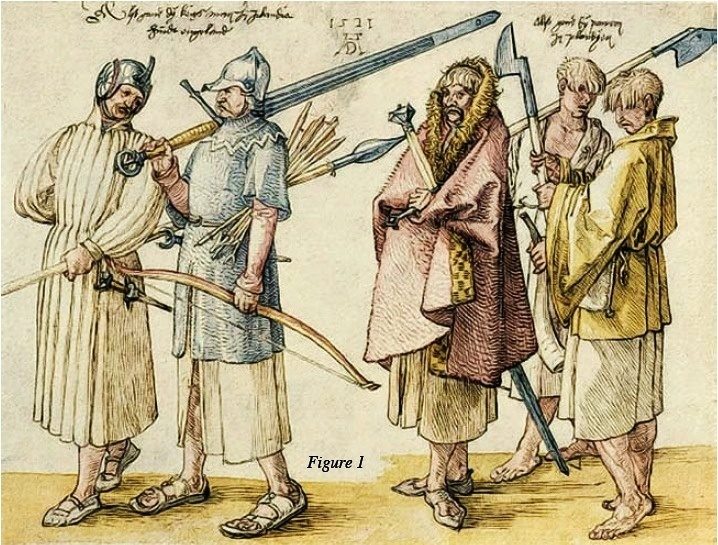 Will the warband stand up to the epic endeavors of the historical Anglo-Danes? Well, they certainly will strive to do so. 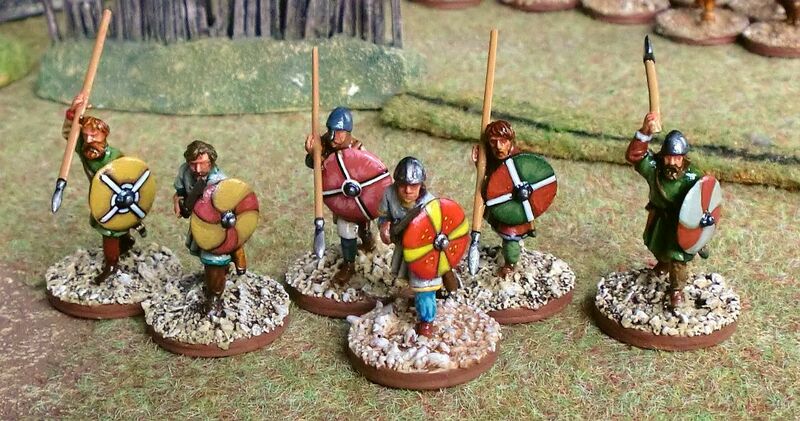 And here I present the Anglo-Danish warband in detail. I can see a degree of increased expertise in painting the 28mm figures. I do think it was a good idea to paint the warlord last. That makes him stand out as the figure painted best as it befits. For the last 6 models I went for duller colors with the shields which suits well with the natural dyes I envision for the warriors of the period. With the 6 point warband completed I might add a group of warriors / mercenaries or a hero of the Viking age later on. 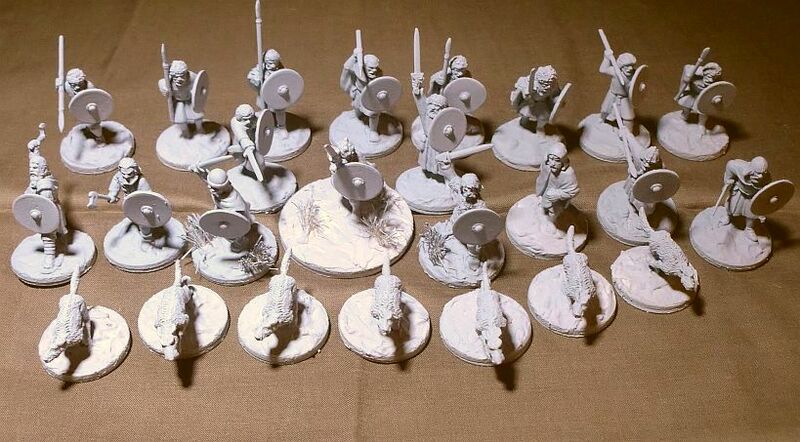 The warband also can serve as the basis for a later conversion to Anglo-Saxon by adding more warriors. But right now I am quite content with the Anglo-Danes as they are. So here we go, on to glory and death. 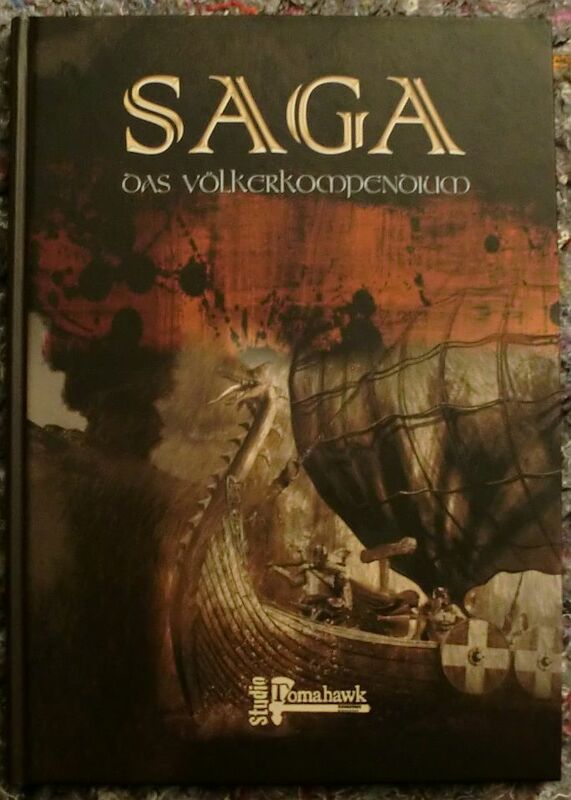 Anyone near and far who dares to challenge the prowess of our warlord is invited over to a friendly game of SAGA.